The best movies get better each time you watch them. That is why I am now going to praise the 2007 cinematic masterwork Hot Fuzz. A couple of nights ago, I saw that the movie was on Netflix. Of course, I promptly rewatched it. You know what? It’s not just one of the best comedies of all time, it’s one of the best movies of all time. Put it up there with Casablanca and The Godfather. Strong praise, I know! 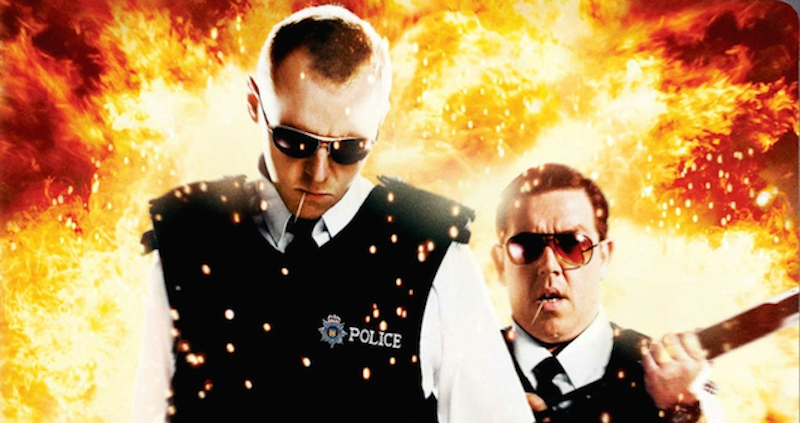 If Shaun of the Dead was Dawn of the Dead, Hot Fuzz would be Bad Boys II. Makes sense, right? Kinda. But also kinda not. From the beginning, Hot Fuzz subverts the audience’s expectations. It begins not with a bang but with a long shot of Pegg’s character Nicholas Angel slowly walking toward the camera. Then comes a montage about what a splendid cop he is. There are a bunch of fake-outs going on there. Pegg is playing against type—before Hot Fuzz he’d been primarily known as a likable slacker like Shaun from Shaun of the Dead or Tim from Spaced. Here, he was playing a cheerless, uptight civil servant. He’s not the sort of devil-may-care renegade popularized by Cop Cinema, he’s the straightest arrow on the force. He is so straight, in fact, that the brass at the London Police Department have decided to reassign him to the country and get him out of the way. Sgt. Angel is frustrated by the willingness of the police force to write off a series of increasingly suspicious deaths as “accidents” and begins unraveling a complex real-estate scheme that links the victims. It’s a plausible mystery, and it implicates the most obvious villain in the movie—Timothy Dalton’s wonderful and dastardly shop-owner Simon Skinner. Spoiler Warning: I’m about to give away the movie’s big twist. So maybe make sure you’ve watched it and then come back. Dalton is a red herring that makes the eventual reveal—a “ Final ending of Clue” sort of deal where it turns out the entire town is in on it—funnier, particularly because the actual motives for the murders are so absurd. That guy wasn’t killed for poaching a land deal, he was killed because his house was an eyesore. That woman wasn’t killed in a real-estate scam gone wrong, she simply had an annoying laugh. Skinner is in fact guilty, but so is everyone else. When you go into Hot Fuzz knowing the twist, everything changes. Rewatching it is almost like watching a different movie, and it’s also where the whole “this movie is a masterpiece” thing comes in. For starters, Hot Fuzz has one of the richest, tightest scripts of any film I’ve seen. Hot Fuzz is so dense with gags that if you lean over to refill the popcorn bowl, you’ll miss four or five of them. Nearly every line of dialogue is either an explicit joke, a set-up to a future joke, or a call-back to a joke that was set up earlier. Some manage to be all three at once. It’s like watching an entire season of Arrested Development unfold in two hours. The self-referential stuff is what sticks out to me each time I rewatch it. That makes sense, since so much of the film plays differently once you know what’s really going on. Most fans of the film probably remember the foreshadowing where Angel meets Joyce Cooper, the woman at the inn: She seems to call him a “fascist,” revealing after a pregnant pause that that’s just a word for the crossword she’s working on. “Hag,” Angel appears to call her in response… before pointing to another entry on her crossword. The rampaging swan is one of the movie’s most obvious running gags. See, there’s a swan loose in Sandford, and Danny and Angel must apprehend it. They don’t catch it on their first outing, so it turns up at key moments throughout the film. The bird plays a crucial role in the final showdown. When Inspector Butterman tries to make his final getaway, it’s the swan, not the heroes, that brings him down. There are more subtle references to the swan threaded through the script. When Angel and Danny return from their first unsuccessful attempt to capture the it, they’re suitably embarrassed. “No luck finding them swans, then?” asks woman at the shop. “It’s just the one swan, actually,” comes Danny’s reply. Later, Angel has abandoned his murder investigation. He and Danny are back in the shop buying Cornettos. That earlier line finally echoes: “No luck finding them killers, then?” asks the clerk. “It’s just the one killer, actually,” replies Danny. Hearing that, Angel finally has his epiphany—it’s not one killer, it’s several. That epiphany sets up what might be my favorite visual gag in the entire movie. Sgt. Angel is eating his Cornetto and stewing over what Danny just said, and he finally puts it all together. He turns to Danny with his mouth covered in ice cream and tells him to punch it. Danny, for some reason, decides to wolf down his Cornetto before hitting the gas. Every time I see that scene, I laugh. I’m laughing right now, looking at the gif. As much praise as the script deserves, the movie’s visual humor is just as good. The primary visual joke is that Hot Fuzz apes the smash-cuts and hyperactive visuals popularized by Michael Bay—call it “Bayhem,” if you want—but uses those techniques to punctuate scenes of extreme mundanity. The disconnect between the editing and camerawork and the actual events on-screen is good for a grin—SMASH CUT TO a cop preparing to do paperwork…. EXTREME CLOSE-UP ON a man watering a plant. It’s a perfect recreation of a shot we’ve seen in a hundred action movies. The camera sweeps out, tracking quickly backwards as the heroes flee a building. The moment the whole building is in the shot…. BOOM, it explodes, propelling them forward and just out of harm’s way. The punch line, of course, being that the mine doesn’t actually explode. We get that great shot, but none of the payoff. The action sequences have so many good gags that I’m willing to forgive a few minor missteps. There’s the little stuff, like the fascist/hag joke I mentioned earlier, or the fact that the old guy in the big puffy jacket really was carrying a shotgun under it this entire time. One of the biggest criticisms of Michael Bay-style filmmaking is the constant, frantic editing. No shot lasts more than a second, and most are in and out in a fraction of that time. It’s one of those things that I’ve found difficult to unsee; the moment I realized that no Michael Bay action sequence holds a shot, I became unable to focus while watching his movies. Eight different camera angles! For an action that takes about one second. It might be the best Michael Bay joke in the whole movie. Early in the story, Danny is peppering Sgt. Angel with questions about his action-packed tenure as a London policeman-officer. Has he ever smoked a fool? Has he ever been in a high-speed chase? Has he ever fired his gun up into the air and gone “arrrrrrrr!”? Danny demonstrates what he’s talking about—it’s a scene from Point Break where Keanu Reeves has a clear shot at Patrick Swayze’s bank robber but just can’t do it because he and Swayze have become surf bros. Instead, Keanu empties his clip into the air and cries out in frustration. No, Angel says, he’s never done that. That’s Hot Fuzz. It’s a movie so rich that it pulls threads from other movies and weaves them into itself, eventually doubling and even tripling back. Not a second is wasted; every joke eventually ricochets and hits you when you didn’t expect it. It’s operating on a different level of sophistication from the films to which it pays tribute, but that tribute is genuine: Hot Fuzz believes in the power of dumb action movies, and it delivers on that belief straight through until the credits roll. It’s one of the smartest, funniest, most rewarding movies I’ve seen. Hot Fuzz is a god damned masterpiece.